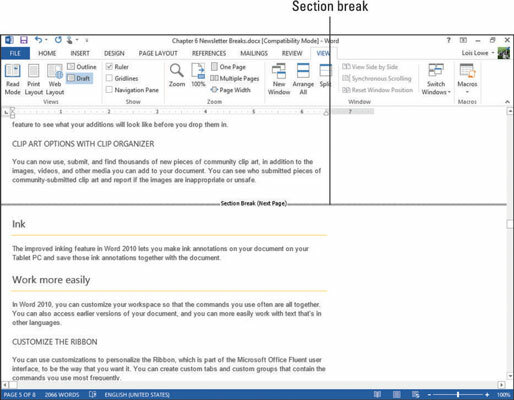 Word 2013 enables you to create several types of section breaks. The four types of section breaks are broken down into what they do and when you might use each type of break. three-column news story beneath it. results in two page breaks. Odd page Starts the new section on an odd-numbered page. Most books begin a new chapter on an odd-numbered page. Open a Word 2013 doument. Scroll down to the place in your document where you need a break, place the insertion point immediately before it, and choose Page Layout→Breaks→Next Page. A section break is inserted that starts the next section on a new page. If the hidden characters are still displaying from the previous exercise, click the Show/Hide button on the Home tab or press Ctrl+Shift+8 to turn them off. Choose View→Draft to switch to Draft view so you can see the break. Click the break to select it and then press the Delete key, if the break is in the wrong spot.